Paul's on his way over to Rosie when Pepper bursts in through the door, getting in before him as she makes a beeline over to Rosie who's at the bar. Pepper wants all the goss about what happened during the convo with Frazer, but Rosie's not so keen to tell, not that Pepper listens to that though. Oh no, she's far too busy rambling on about the names for Rosie and Frazer's future kids- Frazer Jr. or FJ if it's a boy and Heidi if it's a girl (in honour of Pepper of course) and hopefully that girl won't end up with a ridiculous nickname as Pepper did! ROSIE: Pepper, there's not going to be a Heidi, OK? PEPPER: It's not that bad of a name! Rosie proceeds to tell her housemate about the disatrous date with Frazer as Paul looks on from a table at the other side of the room. He can apparently hear everything that's being said from there too despite the very loud music in the bar and being many meters away. Anyhooo… Pepper's speculating about what went wrong with the date with Frazer thinking it could have been bugs, Rosie throwing up, Zeke's advice not helping etc but Rosie says it was none of that. Frazer's read her list of pros and cons, that's the problem, and he now thinks she's shallow. Pepper says it's weird that Frazer took these lists so badly when Paul didn't even blink when he had his read out to him. ROSIE: You showed Paul the list? PEPPER: Only long enough for him to read it! Rosie can't believe Pepper showed Paul the list. Pepper apologises as we see Paul smile to himself in the background. Frazer's eating instant noodles while Pepper tries to talk to him about the lists, asking if he's really so insecure that a list pointing out some flaws will make a great difference. FRAZER: (mentioning a flaw from the list) ‘Chewing too loudly'? PEPPER: We've all noticed. But it's little things! In time they're the quirks that Rosie will fall in love with! FRAZER: Or, it'll finally be the thing that drives her to cut off my… *wink, wink* (AN: Think of Loretta Bobbitt and what she did to her husband, that's all I'm saying!) …in my sleep. PEPPER: You're an idiot! You're letting true love pass you by! FRAZER: (with a mouth full of food) None of your business! Maybe if you got a boyfriend of your own you'd stop sticking your nose into other people's relationships. Pepper doesn't seem to pick up on these possible signals of doom though because she's too excited about other bits of what Frazer just said. PEPPER: So you are saying ‘a relationship'? This is great! Frazer rolls his eyes a we hear a loud knock on the door. He tells Pepper to get the door because he's got a bowl of instant noodles to finish and he'll be eating them as loudly as he wants to! He does too, making these loud chewing and other weird noises he's making remind me of what my brother sounded like at five while eating. At the door Pepper finds a young, nice-looking guy who introduces himself as Ringo, George's younger brother. All The Beatles members were mentioned in an episode a while back and now the whole band is complete then since we already have a Paul and we also know Frazer has a brother called Johnny! How fun! In the kitchen Frazer's nearly choking on his noodles as we hear Pepper making a joke about the Beatles too. RINGO: I'm Ringo, George's brother. Is he home? PEPPER: Yeah, he's out the back with John and Paul. Pepper says his joke is very funny, but she's got better things to do than talk to Ringo all day so closes the door in his face. In the kitchen, Frazer looks very uncomfortable. It's raining outside and it's just shocking because it happens so rarely. Ringo, who's made it up the no. 30 driveway to the footpath, looks over towards the driveway outside no. 24 where a teenage girl takes out a suitcase from the boot of a car while sending looks over at him and smiling. Ringo asks her what she's staring at and she says it's nothing. Next we hear Lou's voice calling out ‘Lolly' so this girl with brown hair and olive skin must then be the more grown-up version of Lou's very blond daughter Louise who hasn't been seen since 2001. Wow, who da thunk it? Lolly tells Ringo that she'll see him later, if he's lucky. Just as Lolly walks up the driveway to her new home, Frazer appears behind his brother and they share a hug. Frazer wants to know how Ringo found him and the younger brother says Johnny told him all about it. Frazer doesn't think that's an excuse to just turn up in Erinsborough and start snooping around. Ringo asks why Pepper, Frazer's own housemate, doesn't even know who she's living with. Luckily for Frazer, he doesn't have to come up with an answer to this question now because there are more important things to take care of as Rosie starts walking up the street. Frazer shoves his younger brother into the car that's on the driveway so Rosie can't see him as she comes up to him. ROSIE: Have you got a minute? FRAZER: Not really. Shouldn't you be out on your second date with Mr. Perfect? Rosie looks a little sad and asks to have a chat with Frazer about the stuff going on between them a little later which he agrees to. After Rosie's gone, Ringo gets out of the car and wants to know what's up with his brother and Rosie. Frazer explains she's another one of his flatmates, but Ringo recognises her from somewhere. RINGO: No, I was at boarding school, I've seen photos. That is so Rosanna. RINGO: Why are you living with Johnny's bride-not-to-be and why is she calling you Frazer? Uh-oh, looks like someone's busted now! Harold arrives back home from the store to find a very tired Lou as Lolly comes out of her room saying it looks lovely. Somehow Harold instantly recognises Lolly even after not having seen her for years and her changing appearance completely. Well done, Harry! Harold assumes that Lolly will be staying until the end of the holidays then, but Lou says it'll be a little longer than that. Lolly, who looks an awful lot like a more grown-up Summer Hoyland only with darker hair, I must say, goes to finish unpacking after saying hi to her ‘Uncle Harold' and Lou apologises for springing his daughter on him in this way. HAROLD: So what, three, four weeks? LOU: A piece of string, my friend. A piece of string. Harold comments on how full the house is at the moment even without extra guests, but Lou reminds him that they could always use another baby sitter. Lolly pops her head back in and asks if it's OK if she puts her clothes in the wardrobe and Lou says that it would be fine. Lolly says ‘Thanks, Dad' and then Lou and Harold smile at hearing the Dad word being used again. Frazer and Ringo are having a chat over OJs with the younger brother commenting on how nice the Bar is. I can hear all the viewers who think the SB looks tacky laugh from over here at this comment! Just as Ringo asks if Frazer comes to this bar often, NedInASuit™ shows up asking if he can buy his mate Frazer a drink, holding up a big wad of $20 bills that he's got from some big win that he had today. Ned made a bet on the tennis despite Frazer's advice against doing so because his instincts told him to do it. Frazer asks if they can talk about it later and Ned tells him not to have any hard feelings, after all, there should be room in Erinsborough for the both of them. After Ned leaves, Ringo says he could see himself stay around for a bit. Frazer disagrees though, telling his brother he's going home. Ringo says he's not going anywhere until he finds out exactly what's going on. Frazer says he doesn't have to explain himself. RINGO: Is that right, GEORGE?!? Ned overhears this so sends Frazer a look of interest… I think, I mean, it's so hard to tell with Ned and his minimal range of facial expressions. Ringo suggests Frazer's strange behaviour has something to do with ‘that girl', ie. Rosie, and Frazer agrees to talk to avoid his brother calling him George in public again. RINGO: You figured you'd have a crack yourself? FRAZER: No! It's not like that. FRAZER: It's kind of like that. At first I just wanted in to the Cammeniti family, but now I really, really like her. RINGO: She doesn't know who you are? FRAZER: I couldn't just rock up and say ‘Hi, you know that loser fiancé you just dumped? I'm his brother. Fancy a sequel?'. RINGO: Johnny had it coming. This tooth pick has more personality. Ringo goes on to say how he's felt trapped with the family for the past six years since Frazer left home since he had no one to muck around with anymore. Frazer says he couldn't take his then 10-year-old brother with him when he took off to start a new life. RINGO: Well, that's why I'm here. I want one too. FRAZER: You're not staying! You're only… How old are you? RINGO: I'm sixteen! I can do whatever I like and I'm not going back home. Ever. Susan's on her knees planting some random plants wearing a hideous jacket while ScruffyKarl™'s sitting in one of those deck chairs reading a book and munching on a pear a few metres away. Pepper appears and Suse asks who she's signed up for the blogzine. Pepper says she's got some twins with a difficult-to-pronounce surname to work on it and Suse says that could be a challenge, but it's right, and so is this other girl called Antonia who's smart, but very committed to her ice skating regime so she may not be all that reliable. Susan and Pepper exchange looks over his reaction and Suse says she reckons her newest teacher has done a good job with her recruiting. Karl then finds it appropriate to inform his girlfriend that ‘we' seem to have put the plants too close together. SUSAN: What's this ‘we' stuff you keep going on about and remind me again how this is supposed to be relaxing? KARL: (gets out of his chair and walks over to the flowerbed where Susan's at) What could be more relaxing than putting the cycle of life into action? SUSAN: Gee, I don't know, maybe lolling about in a deck chair eating pears! Karl re-reads the instructions on the plant instruction where it says they need to be 40-50 cms apart. Suse complains about the lack of tools to carry out that instruction though and goes on to tell Pepper exactly what's what with this whole gardening thing. SUSAN: You know, believe it or not, this is actually Karl's garden, but I've done all the work. His Majesty has a groin injury. Susan gets up and grabs the pitchfork as she walks over to where Karl is sitting. KARL: What are you up to? He gets up to try and get away from her, but she follows him closely behind as he walks around his deck chair, holding up the pitchfork as to gore him at any second. KARL: Hey, Susan… Susan… Steady on. SUSAN: Sore leg, my foot! *You* have been faking it! KARL: Sweetheart, it's still twinging a bit. Hey, it comes and goes! Pepper sees this as an opportunity to get out of the way someone gets hurt, so quietly moves to the side while Karl points to the wrong leg as he's explaining where it's still hurting. KARL: I know how debilitating these soft tissue injuries can be, I just don't want to take the risk, that's all. Susan throws the pitchfork at his left foot, but he pulls away before it hits him. SUSAN: Pepper and I are going to have coffee and a large piece of expensive, non-organic cake. (throws Karl's garden gloves on him) I might even have two! Enjoy your moat! Pepper looks like she's about to say something, but Suse tells her that she wouldn't dare apologise to Karl or else. Karl looks a little sad over having been sprung. Harold tells Lou he didn't even realise that Lou would be visiting Lolly, but Lou says he couldn't go past without stopping by as his daughter is eavesdropping in the doorway from the bedroom corridor into the kitchen. Or actually no, that's not the reason at all because Lolly's been ‘kicking up a fuss' at school. Harold says that's no big deal, some days he had to literally drag Kerry to school to get her there. Lou says it's more than that though. LOU: Lolly accused Sandy of not caring for her in the way she cared for her own kids. ALL VIEWERS: WHAT OWN KIDS? Seems the writer of this episode forgot the finer details of episode 3875 when Sandy told Lou she was infertile. Ooops. Anyway, Lou continues his story by telling Harold how Lolly just wasn't happy with the Allens and begged him to take her home to Erinsborough. LOU: I just couldn't say no. She needs me, Harold. Harold says that might be the case, but the Allens are still the ones who were awarded custody over Lolly. Lou says that Sandy and John agreed for him to take care of Lolly as they are having some marriage problems at the moment and the tension between Sandy and Lolly isn't helping. A change of scenery might do her good though. Just then Lolly comes out of her hiding pretending like she hasn't heard a word of what was just said and Harold and Lou play that game too, acting like they weren't talking about anything serious at all. Lolly hands Harold this bookmark of Pink Heath she bought for him at a roadhouse on the way down and begs him not to send her home again. She puts on her best act of being an upset teen and brings on the tearworks, telling Harold that he won't even know she's there as long as he lets her stay. Harold hugs her and tells her that she can stay as long as she likes and across the room Lou mimes ‘thank you' to Harold for agreeing to take on another guest in his house. After a kind of creepy, moving stock shot of no. 22 that moved up the driveway, we see Paul let Rosie into the house. Rosie wants to know where the hired help is, but Paul says he hasn't got any help. He has located an Italian recipe however and is chucking ‘stuff' in pots and so far there are no casualties. ROSIE: Going for the understated homely approach this time? PAUL: Yeah, well, I think last time I did try a little bit too hard. ROSIE: Mmm, and tried it on. PAUL: Look, I could have taken you out on my boat or up in a plane, but the thing is it doesn't matter as long as we're together. Paul tells Rosie he would just like to spend some time with her with no showing off or fancy stuff. Just him. She agrees and they walk over to the kitchen table with Paul grabbing the bottle of wine that's standing on the kitchen counter. Susan's hugging Lolly, who she also recognises instantly despite Lolly's complete makeover since last time she was in town which is very impressive. Karl walks over to the kitchen and places his wallet on the kitchen counter on his way over to the fridge. Suse reckons Lou's daughter has turned into a fine young woman and Lolly comments on Mrs. Kennedy's ‘hot' haircut. Susan explains how technically she's actually Mrs. Kinski these days. 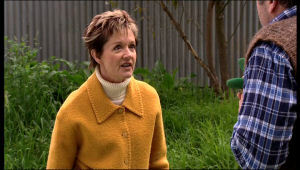 Lolly apologises saying she knew about that, really, since Lou likes to keep her updated on what's going on in Erinsborough. Karl butts in asking whether the guests would like to have rice milk or soy milk with their chai. Lolly says she'll help him out in the kitchen which gives Lou a chance to talk to Susan about Lolly staying in town. He'd like to re-enroll her at Erinsborough High. Susan says she's sure they can find her a place since ‘any school would be lucky to have her as a student'. Karl tells Lolly that her being in high school makes him feel old and she replies that he, Dr. Kennedy, doesn't look any older at all! How on earth she can see that with all that scruffiness he's covered in at the moment, I'm not sure though, but maybe she's got magic powers or something, just like Paul! Karl points out that it's not Dr. Kennedy anymore though, he's just Karl now since he's a home farmer, not a doctor these days. He's mainly doing organic farming since they could do with some self-sufficiency. Lolly doesn't quite get it though so asks Karl what he does for work outside of his farming and Susan puts her arms around her and just laughs. Rosie doesn't feel so good at dinner and Paul thinks he's overdone it with the oregano. It's not that though, Rosie says, it's the garlic he's put in it. ROSIE: Let's just say we're not in any danger of being attacked by vampires any time soon. It's good, really, I hate vampires. Rosie says it's not up there with her Mum's cooking, but still perfectly edible. Paul says he likes that and then his mobile goes off. He checks the caller ID and it's Lyn calling. This is the first time she's called him (since the wedding/break up I presume) and he's a bit surprised. Paul excuses himself and gets up from the table and into the living room as he answers the call. As it turns out it's not Lyn calling, but Oscar, and Paul gets all cheerful at hearing the sound of his lost "son". We see Rosie squirm in her seat and look really uncomfortable over in the kitchen as Lyn apparently grabs the phone from Oscar. PAUL: Hello? You ther… Oh, Lyn, hi! No, I didn't. Oscar called me. Paul looks a little happy there for a second which, you know, he should because he's talking to his *wife*, who he loves very much according to his own accord, of all people. That's all he manages to say until Lyn hangs up on him. He looks a little sad at not getting more time on the phone and Rosie who's still in the kitchen looks even sadder. Susan and Pepper are sitting on the sofa looking at web design suggestions for the blogzine when Karl comes over to search behind, under and in between all the cushions in search of his wallet. KARL: I've lost my wallet! SUSAN: Well, that's easy, just follow the moths! Karl says he's sure the wallet was on the bench before and he's checked the car twice and he still can't find it. Pepper asks if they've had any visitors lately since her Nana once got robbed by the vacuum salesman so you can't trust anyone. Susan says that Lou and Lolly are the only visitors they've had today. KARL: (light bulb going off in his head) Lolly… Lolly! SUSAN: Lolly didn't nick your wallet! KARL: Just a minute, she was very keen to help me make that tea! KARL: That gave her the opportunity, didn't it? SUSAN: Get back in your box, Inspector Clouseau! Don't blame your senility on an innocent young girl! The phone rings and Karl goes to answer it. 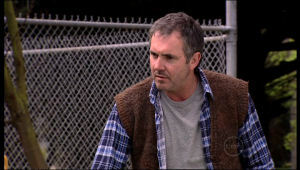 KARL: (into the phone) Karl Kennedy, victim of crime. The tone changes quickly though when TelephoneChipmunk™ tells Karl that something's happened to Katya. This gets Susan to get up from the sofa and hurry over to where Karl is standing. 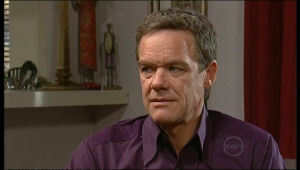 Karl tells Susan that Katya's in hospital after being beaten up. They take off in a huff, leaving Pepper behind. Well, they certainly are doing snazzy new things with the stock shots today since we have a nice shot of a new sign that says Erinsborough Hospital and there's also a new stock shot of the hospital itself. Susan is half-ranting to Karl about Katya and how she's had to endure so much. How much more can that girl take and where were the police when this happened? They run into NedInASuit™ in the corridor and he assumes that Karl and Susan are there to visit Toadie, but they soon correct him by explaining how Katya's been taken in after being assaulted. Ned asks if he can see her but they tell him they'll just go and see her first themselves. Katya's sitting in her bed when Susan and Karl come in and tells Susan that it's ‘not that bad, really' although Susan still fusses over her. Karl asks who did this to her and she says she's not sure, although she suspects Guy had something to do with it. Katya says she hasn't said anything to the police about it and Suse tells her this has got to stop. Katya agrees and that's why she's decided to tell the police everything despite Guy's attempts to keep her quiet. Karl tells Katya that no matter what she does she'll have his and Susan's full support. Katya says she couldn't do it without her step-parents. Susan reminds her that they're not the only ones who care about her, Ned does too and he's waiting outside in the corridor hoping to see her. Paul's explaining to Rosie what the ‘horsie' thing with Oscar is all about while taking the plates off the table with Rosie looking quite uncomfortable as the story goes on. PAUL: That was a silly game we used to play. I'd crawl around on all fours with Oscar on my back and he'd feed me hay. It was a good ?? sometimes if I was lucky. Sitting back down at the table, Paul's all smiley, but calms down when he sees the look on Rosie's face. PAUL: You had to be there, I guess. ROSIE: Oh no, I come from a big family. I know what little kids are like. PAUL: Yeah, well, that's the thing. I don't… See, I was too busy thinking of myself to pay any attention to my kids at that age so Oscar was sort of my second chance. (looking up at Rosie and realising this is perhaps not the right person to share this stuff with) Oh sorry, you don't need to hear this. ROSIE: The secret's out, you have a soft side. It's kind of what made me like you in the first place. PAUL: Yeah, and I like you too. (takes her hand) Very much. ROSIE: The way I'm struggling with is the way you moved on from Lyn so quickly. PAUL: I was interested in you before Lyn and I split. You were there, remember? ROSIE: Look, you're a great man, Paul and… I know there's something between us. But you're not what I'm looking for. You've had this amazing life and that's wonderful and exciting. But I'm just starting mine. Everything's in front of me and I guess I'm just looking for someone to share that with me right from the beginning. PAUL: That could be me! Ned comes in and Katya tells him she thought he was a detective. He tells he he's not sure whether to be flattered or offended by that comment. Ned tells Katya she's doing the right thing and that things will be fine. Further he explains how he really enjoyed their time together and Katya says she did too. Ned says they could always re-create that thing they had right there and then if Katya's up for it and leans down to kiss her. Katya tells Ned to control himself and he says for her to trust him because he is in control. Ned goes to lock the door and then they start sucking face. Oh joy. Lou is rehearsing his flight attendant speech (you know that one they always do before take off about safety and things) in front of Harold and Lolly using one of Kerry's baby monitors as his microphone. Harold asks how long it'll be before Lou goes away on his first flight and Lou says it'll be soon. That reunion with Mishka gets closer by the day. Lolly says he seems to really miss her and Lou says he does. LOU: (to Lolly) But keen as I am to get to Russia, you are my first priority, OK? Besides, taking this new job means that Lou will be able to look after her better too. Lolly says she's got some pocket money saved up though if he needs it and she's done heaps of baby sitting if Harold ever needs help with looking after Kerry. Harold says he'll keep that in mind. Lolly volunteers to make them all a cuppa and goes to the kitchen. She pulls out Karl's wallet and takes out all the money that's in there (which looks like roughly… *counts* $100) before throwing the wallet in the bin and then taking out the bag full of rubbish while she kettle boils. On the sofa, Harold and Lou exchange looks that only an old couple would usually exchange and I can now see all slashers going ga-ga over this because it's further proof of the love between these two. Frazer sits Ringo down at the kitchen table and tells him that he can stay until the end of the school holidays, but that's it, and only if their parents approve of it. RINGO: Shall I come up with a name for myself too? RINGO: I always wanted to be called Claude. Or Brock. RINGO: So tell us about your grand plan. FRAZER: There is no grand plan. I've lost Rosie so I'm just going to come clean. RINGO: Then she'll never like you. FRAZER: She doesn't like me anyway! Ringo says he'll go for a swim and Frazer tells him to wear his bathers. Ringo reckons that would be boring though so won't. Pepper and Rosie come in and it only takes a second before Pepper has excused herself to go do something else so that Rosie and Frazer gets a chance to have that chat they were going to have. Rosie takes a seat at the table. ROSIE: …But that list was more about my own insecurities than your shortcomings. Look, the point is I like you, Frazer. A lot. And maybe I was just so scared of my feelings that, I don't know, I was trying to talk myself out of it. I've been looking for someone who I can share my life with right from the beginning. And I think that maybe that person's you. FRAZER: (after a few seconds of silence) Woah. ROSIE: I've left this too late, haven't I? FRAZER: No! No, no, you haven't. FRAZER: Can I just repeat? Woah. They're just about to kiss again when Ringo comes back in. RINGO: Don't worry about the bathers, there's some guy out there stealing the pears. (sees Rosie) Hi. ROSIE: Who are you? Frazer? RINGO: I'm Frazer's brother. Rick. Rick Yeats.